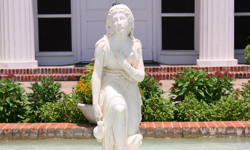 Created in Rome by J. Warrington Wood in 1875, the sculpture and the Lillian Schnitzer Fountain were dedicated to her memory in 1964 by George Schnitzer. 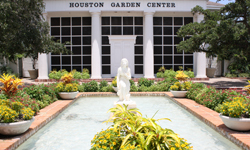 Together, they grace the entrance to the Houston Garden Center in Hermann Park. The sculpture of a kneeling woman stands atop a concrete base in a shallow, brick-lined pool. Her proper right arm holds a water jug and her proper left arm is raised to her chest. A plaque on the pool reads: In Memory of Lillian Schnitzer “…A Spirit Still and Bright with Something of an Angel Light 1964.” The plaque at the rear of the pool reads: Sculptured in Rome 1875 J. Warrington Wood.